This K&M Bundle Includes: (1) Audio Technica ATH-M50x. As the most critically acclaimed model in the M-Series line, the ATH-M50 is praised by top audio engineers and pro audio reviewers year after year. Now, the ATH-M50x professional monitor headphones feature the same coveted sonic signature, with the added feature of detachable cables. From the large aperture drivers, sound isolating earcups and robust construction, the M50x provides an unmatched experience for the most critical audio professionals. 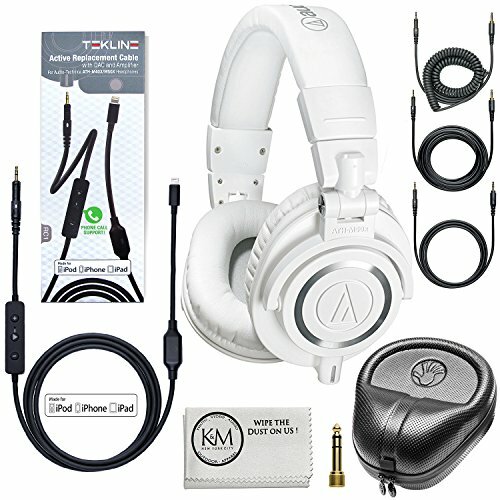 Includes: (1) Tekline RC1 active replacement cable with DAC and Amplifier that provides a direct path for high quality audio from any Apple device with a Lightning connector to Audio-Technica ATH-M40x/M50x/M70x headphones. The cable is made for iPod, iPhone, iPad, is 4 (1.2 m) long and also has phone call support and volume adjustment. Includes: (1) Slappa HardBody PRO Full Sized Headphone Case (Black). Includes: (1) K&M Micro Fiber Cleaning Cloth. Audio-Technica MTH-M50x Professional Studio Monitor Headphones. Detachable 1.2m - 3.0m (3.9' - 9.8') Coiled Cable - Detachable 3.0m (9.8') Straight Cable - Detachable 1.2m (3.9') Straight Cable - Protective Carrying Pouch - 6.3mm (1/4") Screw-On Adapter. Critically acclaimed sonic performance praised by top audio engineers and pro audio reviewers. Exceptional clarity throughout an extended frequency range, with deep, accurate bass response. Tekline RC1 provides a direct path for high quality audio from any Apple device (works with iPod, iPhone, iPad) with a Lightning connector to Audio-Technica ATH-M40x/M50x/M70x headphones. Slappa HardBody PRO Full Sized Headphone Case Black + K&M Micro Fiber Cleaning Cloth.